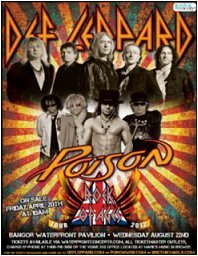 Waterfront Concerts have today announced a new show by Def Leppard/Poison and Lita Ford for 22nd August in Bangor, Maine. This is the second confirmed show of the next leg of the Rock Of Ages Tour 2012. Vivian Campbell has also confirmed the band will visit Charlotte and Pittsburgh earlier in the same month (see previous News update). The band last played in Bangor on 6th August 1981 when supporting Ozzy Osbourne on the Blizzard Of Ozz tour. Tickets for this new show are due to go on sale at 10am on Friday 20th April.